Russian President Vladimir Putin announces surprise inspection of Armed Forces. Mobilization will be assessed during a surprise inspection of the Russian Armed Forces launched on June 14 in line with a decision adopted by Supreme Commander-in-Chief, President Vladimir Putin, Russian Defense Minister Gen. Sergei Shoigu said during a telephone conference. "Another surprise inspection began at 7:00 a.m. today [June 14], in accordance with the decision made by the supreme commander-in-chief, in order to assess combat and mobilization readiness. The inspection will be carried out at a number of weapons and hardware storage facilities, as well as individual military control agencies," Shoigu said. "In addition to forces' preparedness to tackle their intended tasks in armed conflicts of varying degrees of intensity and crisis situations, it is also necessary to give special attention to the Armed Forces' mobilization component, the state of reserve units and reserves of weapons and military hardware currently in storage," he said. "Special attention will be given to organizing the work of operational personnel when planning the application of forces in various crises," he said. The inspection will also have to assess mobilization readiness and the ability to tackle territorial defense tasks with the complete mobilization of individual military control agencies and units, he said. 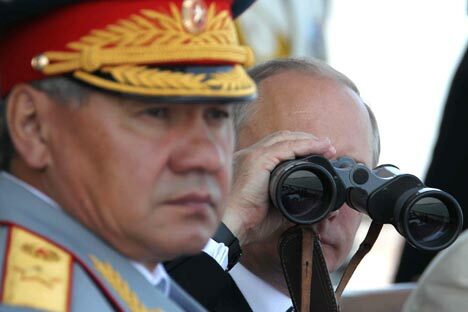 The inspection is due to continue until June 22, Shoigu said.